As the end of last year, I was at a Microsoft event where we got to see a number of new Microsoft technologies. At this event I got my first chance to have a look at the XBOX 360 Kinect. Since I’m not a gamer I hadn’t paid much attention to what a Kinect was until I actually saw one and had a play on one. Then I instantly wanted one. If you’ve never seen it, even if you are not into computer games, I would highly recommend you have a look. Anyway, since arriving back home I decided to have a look at getting my hands on one. I’m not a gamer. so I don’t already have an XBOX 360, but since all the options were explained to me I now know exactly what I want. And what I want is an XBOX 360 250Gb HD with the Kinect sensor bar. I know I should be able to get that bundle for somewhere in the region of £300. But I’m looking for a deal. With that in mind I went looking for options. So I searched on Bing and Google. They both return advertised links (PPC: Pay Per Click) as well as the regular (“organic”) results. So, I click on all most of them opening them in to new tabs. (Remember, I am looking for a deal, so I want to compare quickly what each of the offerings are). 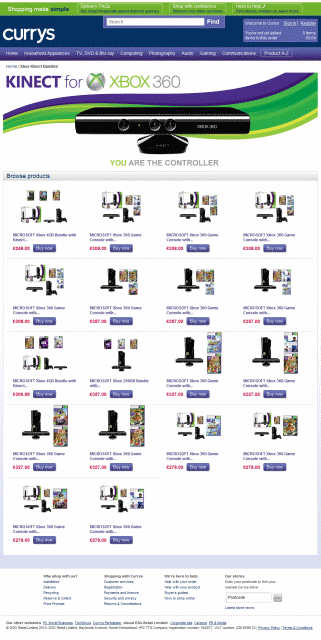 Currys has a paid link with the tag line “Buy Xbox Kinect. We are in stock Reserve and Collect yours Now.” [sic] It sounds promising, doesn’t it? So, I click the link and go looking for the price. Nope can’t see a price. Some form of Add to Basket link, surely that’ll get me a price. Nope, can’t see that either. Anything at all that looks remotely like some form or buy/purchase/reserve link. Anything at all! Nope. Not a thing. I know what I want. I’m motivated to buy. All I want to know is that you’ve got it in stock and how much you want for it. Well done Currys, you’ve wasted money on advertising a product that I cannot see how to actually buy. I got so irritated that I went to close down the tab in my browser. But… I didn’t do that. I got to thinking about how the follow up from the advert had not served its purpose. The advert hooked me in, but the website was so ineffectual that I was heading off elsewhere. So, how do I actually buy it? There is no “buy this” call to action, so I really don’t know where to go from here. Any button I press is going to be a bit random and I have to think about what is likely to give me the best route to accomplishing my goal. I really feel at this point that the website isn’t doing its job properly. Surely the purpose of this website is to get people to buy stuff? That’s how it makes money. That’s why Currys spend money on building the site and advertising its existence. It is so they can get people to come to them to buy stuff rather than go to a competitor to buy stuff. Lets consider if this had been a situation where I had actually walked in to a Currys store. It would have been akin to me asking a sales assistant on the shop floor “Can you tell me the price of an XBox 360 with 250Gb drive and the Kinect Sensor bar?" and instead of answering my question they wax lyrical about what a great product it is. I scroll down the page scanning any text for things that look like links or buttons. There are some pictures with “Find out more” links below each of them. Two of them actually have the sensor bar on it, one of which also has the console on it. I actually had to open both links up to figure that out because at scanning speed they look pretty similar. It is only when I’m analysing my actions do I really consciously take in what the difference is. This is not giving me what I want. In fact, Currys are doing themselves a disservice as well. Some of the titles that just say “Xbox 360” without reference to the type of Xbox are actually the 250Gb version, so at a glance I would skip past them because I’ve also seen other descriptions that say “250Gb” so I am assuming it is a lower spec model that I’m not interested in. Had I not been piqued with interest about the issues with this website I’d have left a long time ago. Instead, I took some time to understand what was actually going on and highlight them. I’m guessing there was a meeting at some point to discuss the design of the website. At this meeting various aspects of the site were discussed. In the rush to get the site out of the door short cuts were taken. Certain things weren’t thought about properly. The “Find out more” button actually takes you to a page where you can browse the products relating to the page you’ve just come from. Why not tell me that? I’d have been much more interested if the link had mentioned that I’d see prices, bundle options or what not. Yes, technically I am finding out more, but it didn’t really inspire me to find out more, which is more my point. The product names in the page that allows you to browse the products are all clipped. I’m guessing that at some point a graphic designer put together the some visuals to show how the page should look. A web developer converts that into a working site. The visuals show two line product names but the developer sees that some product names are too long to match the visuals, so the product names get clipped and thus rendered (in situations were there are very similar product bundles) next to useless. Again, time is probably very tight. An unforeseen situation early in the project has now come to light. There is no time to redesign the visuals so the next best solution is taken. That’s to force the product names into the space provided. if I bought the HDD as a separate item at the same time as the XBOX they would discount it so that it was the same total price as buying the model with the 250HDD included. Fantastic! Oh… and they knocked roughly 25% off each of the Kinect games we bought to get going with.